Contrary to speculations, the member representing Ohaozara, Onicha and Ivo federal constituency in the House of Representatives, Hon. Linus Okorie said he remained a strong member of the people’s Democratic Party(PDP). He noted that as founding member of the party, he cannot abandon it especially now that his political ally and former Vice President of the country, Alhaji Atiku Abubakar is now the Presidential candidate of the party. Okorie spoke in his Onicha Igboeze hometown while addressing his people on activities surrounding the party primaries in the state in which he was not give a return ticket. 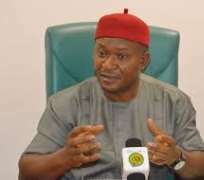 He noted that he is not bearing any grudge against the state Governor Dave Umahi and former Secretary to the Government of the Federation, Anyim Pius Anyim over the party primaries but that he was not happy the way he was treated. “I have no problem with Governor Umahi, I don’t also have problem with Anyim Pius, I have no problem with anybody. In this forthcoming general election, I am totally for PDP. I am supporting Atiku and he is the one God has brought out to salvage this country. I am working for him and I have opened a campaign office in Abakaliki for Friends of Atiku(FOA) which I am the state Coordinator and I have collapsed my political structure into it. fails to deliver. You should set up a committee that will negotiate with candidates on what they will do for you when elected”, he said. Stakeholders and leaders of the Onicha local government area, in their separate remarks described Okorie as their leader and will follow him to wherever he goes politically.